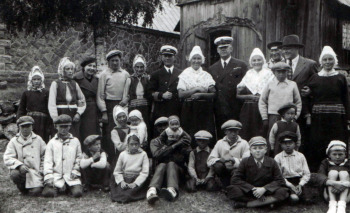 Estonian Swedes, Coastal Swedes (called themselves aibefolke, ‘island folks’), a minority group in Estonia that has developed in the process of Swedish migrants to Estonia assimilating with the locals. The Swedish settlements were located on islands of Ruhnu and Hiiumaa, in the coastal areas and on the islands of Lääne County (Sutlepa, Riguldi, Vormsi, Noarootsi and Osmussaar), and in the coastal areas and on the islands of north-western Harju county (Nõva, Vihterpalu, Pakri islands, Kurkse, Pakri peninsula and Naissaar). Many Swedes also lived in Haapsalu and Tallinn, and 13th–17th century on Saaremaa, in the south part of Lääne County, the east part of Harju County and on the coast of Lääne-Viru County. The oldest documented proofs of Swedes residing in Estonia date back to end 13th century and the beginning 14th century (the first document is Haapsalu Town Law 1294). Most Swedish settlements formed in church domains (Bishopric of Ösel –Wiek, Padise monastery, Pirita monastery). The reasons behind migrating might have been the wish to escape from the power of their landlords, to find better living conditions and perhaps overpopulation in some areas. Estonian landlords favored Swedish migration to the empty islands and coastal areas (as it allowed them to collect more tax). In 1341 the bishop of Courland declared Swedish Law, which meant mainly limited duties and personal freedom. The latter was what set the Swedes apart from the Estonian peasants who were bound to the land and later became serfs. Despite all this, the Swedes were not members of the upper-class but ordinary farmers and fishermen, Swedes living in towns were also mostly commoners. Swedish migration was especially favored after St. George’s Night Uprising (1343–45) to increase the number of Christians. The number of Estonian Swedes reached its peak around the middle of 16th century when their settlement areas reached as far as Kuusalu parish in the east and Sõrve peninsula in the west. By the end of the Livonian Order period 5,000–7,000 Swedes lived in Estonia (2–3% of the population). During the period of Swedish rule that followed the collapse of the State of the Teutonic Order, the situation worsened for Estonian Swedes. Church and monastery lands were converted into fiefs and farm fields into manor fields, duties and taxes increased. Baltic German and Swedish nobility did not recognize the special legal status of the Swedish peasants. After the Northern War, Estonian Swedes lost all their remaining rights and, in some places, their settlements were destroyed. For centuries Estonian Swedes fought a fierce battle with the landlords to retain their status. 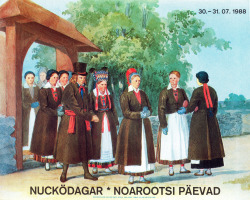 In the 18th century Risti Swedes were turned into serfs, in 1781 1,200 Hiiu Swedes were evicted from their farms and deported to the area around Berislav in the south of Ukraine (most of their descendants returned to Sweden in 1929); many villages in Noarootsi and on Vormsi island were emptied out. The first school where studies were conducted in Swedish was founded in 1650 in Noarootsi but it operated for only a short period of time, students learned how to read at home and in Sunday schools. Only after the Peasantry Laws of the 1850s–60s were passed schools for Estonian Swedes were founded. In 1873, Thure Emanuel Thorén, a missionary from Sweden, founded a teachers’ seminary. During the period of Russification it was closed, and classes were taught in Russian at schools. In the beginning of the 20th century, Russification weakened and a national movement of Estonian Swedes started. In 1902 Johan Nyman and Hans Pöhl started publishing a calendar in Swedish, in 1909 educational society Svenska Odlingens Vänner was founded – it established and supported Swedish schools and organized educational and cultural activities of the Estonian Swedes. There were also fishermen’s unions, sports society, etc. Estonian Swedes owned about 1,000 fishing and coastal vessels (including 56 motor- and sailboats over 20 GRT and 208 motorboats). The first constitution of the Republic of Estonia gave national minorities efficient guarantees. In 1919, Estonian Swedes had their own national minister in the Provisional Government, 1919–40 they had their own national secretary (Nikolaus Blees) at the Ministry of Education. In 1918 they started publishing a Swedish language newspaper Kustbon (Estonian Randlane; published until 1940), 1919 their own political organization was established (Svenska Folkförbundet). For economic reasons Estonian Swedes did not exercise the rights given to minorities by the Cultural Autonomy Law of 1925 and stayed with the constitutional rights (minority language school and local government). Pürksi Agricultural School and Folk University (1920) were founded, and a Swedish-language private upper-secondary school in Haapsalu (1931). In 1930 there were 20 active elementary schools. In 1934 there were 7,641 Swedes in Estonia (0.67% of the population) who in some places (for example in Noarootsi, on Vormsi and Ruhnu) made up the majority or a significant proportion of the population (for example, 348 people on the Vihterpalu-Risti coast and 155 on Naissaar). In the 1930s, political change brought about strong Estonification of the Estonian Swedes. In 1939 old Estonian Swedish settlement areas on Osmussaar, Pakri islands and Naissaar were turned into Soviet army bases. Based on the Soviet-Estonian Mutual Assistance Treaty, over 500 Estonian Swedes were driven out of their homes in 1940. 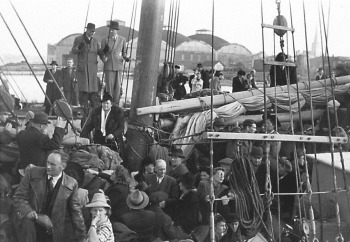 1943–44 German occupation forces evacuated 4,097 Estonian Swedes to Sweden (operation Kleiner Grenzverkehr), 2800 (⅓ of them avoiding service in the German army) escaped by themselves on fishing boats, many of those who stayed in Estonia (about 1,300) were struck by Stalinist repressions in 1940s–50s. The Estonian Swedes who headed to Sweden mostly settled down in Stockholm or in the area around Mälaren. Estonian Swedes in that have established a cultural union called Kulturförnungen Svenska Odlingens Vänner. They have a rich archive, a library as well as a small museum and they have published an array of research papers, overviews, memoirs and literature. Kustbon continues to be published. There are regional and village societies. At the end of 20th century in Estonia there were Estonian Swedes (about 350) living on Vormsi, in Noarootsi, Vihterpalu, Haapsalu and Tallinn; there were some descendants (about 60) of Hiiu Swedes in Herson Oblast in Ukraine. In 1980s ties were established with Estonian Swedes and their descendants living in Sweden in order to restore some cultural traditions, to teach Swedish to those interested, etc. In February 1988 Haapsalu Estonian Swedes Cultural Association was established, in 1990 Estonian Swedes Museum (Swedish Aibolands Museum) in Haapsalu and Ruhnu Museum (a branch of Estonian Swedes Museum since 2012) on Ruhnu were founded. Rootsi-Mihkli (in Tallinn), Vormsi, Noarootsi and Ruhnu congregations are also centers of Estonian Swede activity. Estonian Swedish dialects belong to the eastern dialect group of Swedish. They retain some characteristics of ancient Swedish and are only partly understandable to speakers of contemporary Swedish. Estonian Swedish folk culture has many medieval traits that have vanished in Sweden. The customs and culture on the islands have been especially archaic. A large portion of folk heritage (especially on Vormsi) was destroyed by the religious awakening movement in the second half of the 19th century. The centuries long cohabitation of Estonian Swedes and Estonians has brought about mutual cultural influences (especially in Western Estonia), in for example folklore, customs, cuisine, etc. Estonian Swedes brought many loanwords into Estonian and they borrowed words from Estonian; they have left behind many place names in Estonia (especially on Vormsi). In the 20th century increasing assimilation of Estonian Swedes was detected and the authorities tried to artificially speed up this process in the 1930s – it was demanded that village, farm and family names be Estonified etc.